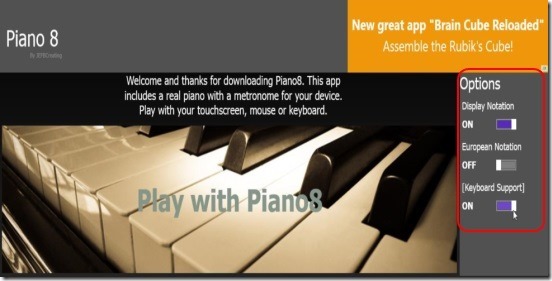 Piano8 is a free Windows 8 musical app. As the name suggests, this free app is a mimic of Acoustic Grand Piano for Windows 8 devices. That is using this app you can now play Grand Piano in your Windows 8 systems. The app has three octaves: Normal, octave up, and octave down, that you can choose and then play the notes, scales etc. or play a whole melody. The sounds are very good and quite realistic. The app supports all the 7 major notes from C to B and there versions for each octave. It’s a great Windows 8 musical app, that can help you learn playing music and raise your interest in music. Also, for all those who love playing Grand piano, but can’t afford them, as they are very very expensive. So, these people can get this Windows 8 piano app all for free! Like I said above, it’s a simple piano app, with a straight purpose: to let you play piano in your Windows 8 devices and nothing else. Playing piano in Windows 8 devices is fun; specially, if you are using a desktop, or a laptop. Because, if you are using any of these then you can play piano either using your mouse or keyboard keys. Playing with the help of keys is really fun, and gives you enough control and space to play each single note. A really cool thing at this point, is you can play up to 5 notes together at a time, and the app will play the combined sound of these notes. Just like in real life. 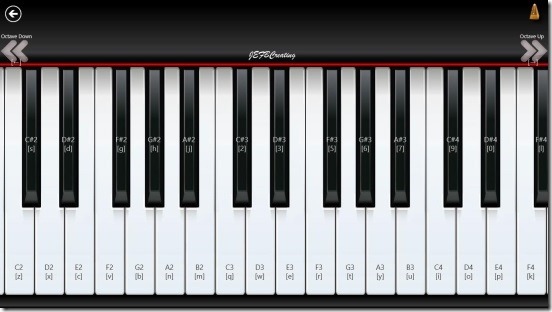 The keyboard keys to play notes are by default shown on top of each single note, so that it can be easier to learn the keys placements and there respective notes. 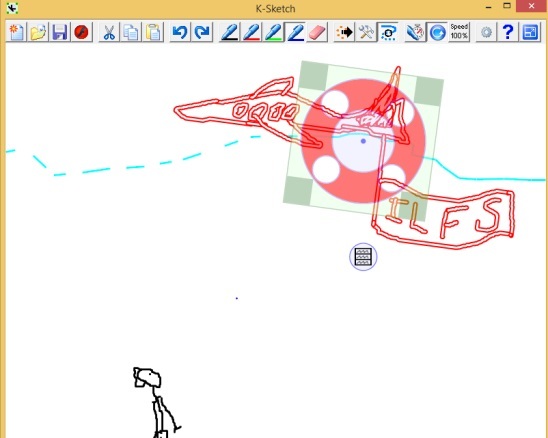 This is a great help. But if you don’t want this help, then you can set it off by going to the Main Screen and dragging the Keyboard Support and Display Notation options slider to left. 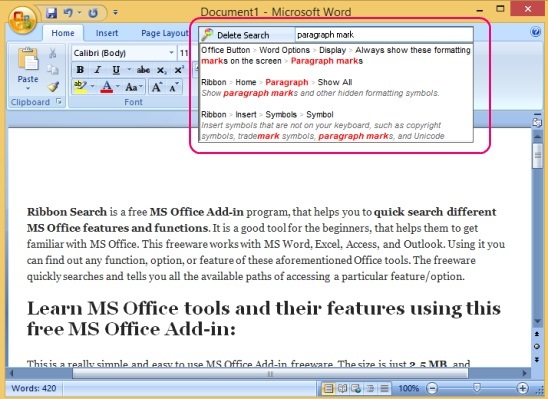 You can also use mouse click or click-drag to play the notes. Whereas the touch device users can tap or swipe to play the notes. But, honestly I feel the app is quite limited to Windows 8 touch device users, because the keys are quite small, making it hard to play notes when you are playing a symphony. Still it’s fun and you’ll surely get keyed in the app. There are Ads, but they don’t bother much. So giving you a clean interface to play. If you want to change the Octaves, then simply click on the Octave Up or Octave Down buttons at the top of the piano keyboard. The sounds of each note is pretty much real. Try playing scale, symphony and the app works totally fine without any lags and crashes. It’s a great app to learn or practice playing piano, or for the amateurs; they can simply hit keys and create something that sounds good. Play Grand Piano in your Windows 8 devices. Has all the notes of a piano. Good sounding notes; almost real. Simple and easy to use/play. Do check out these free Window 8 musical apps: Play Guitar! and Drums. 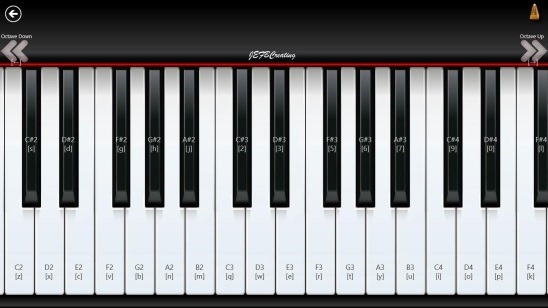 Piano8, certainly is a good Windows 8 musical app. It’s functional and does what it advertises. And above all, it’s all for free and very fun. And I wish, the developers will include an option to record what you played, and some note sheets to practice. Still, it’s a good start. Download this Windows 8 musical app form the Entertainment Category in Windows Store, or click here. You might also like this free Windows 8 Piano app for toddlers.